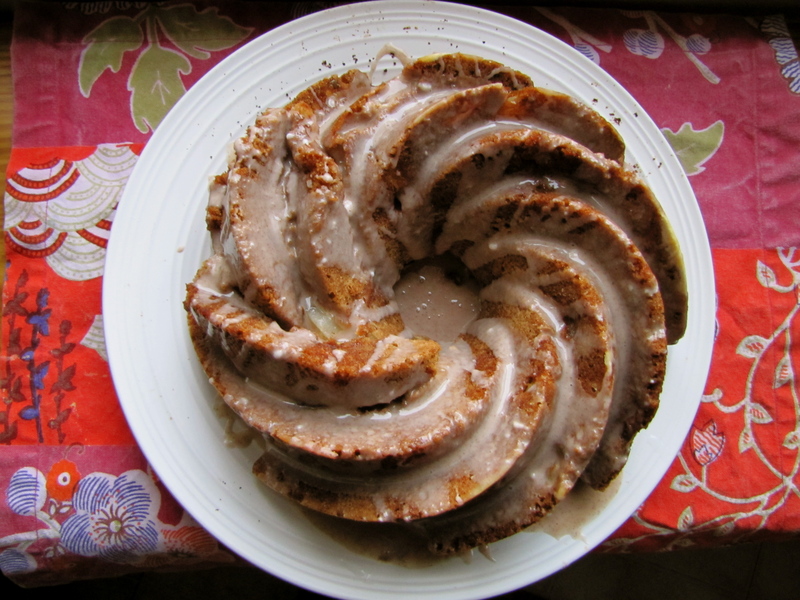 Spiced Ginger Pear Cake with Cinnamon Frosting – Voila! From this angle, the cake looks more like a Krispy Kreme glazed cruller donut! However, the cake is indeed a cake; and what a great cake it is! It is ridiculously moist and flavorful. It has “fall” written all over it – from the pears to the cinnamon frosting. I tried not to eat it for breakfast…but that was just too hard. It is so yum morning, noon and night. 1. In medium bowl, combine flour, baking soda, salt, cinnamon, nutmeg, ginger and whisk to combine thoroughly, set aside. 2. In a larger bowl, combine oil and sugar and beat with a whisk or electric mixer to combine thoroughly. 3. Add egg and yolk and beat to combine thoroughly. Beat in vanilla. 4. Turn mixer to low and add flour mixture, a little at a time, beating until just combined. 5. Using a plastic spatula, fold in pears, ginger and nuts (if using). 6. Scrape batter into prepared bundt pan and spread evenly. Place pan into oven and bake until toothpick inserted into center comes out clean, about 50-60 minutes. Let cool completely before frosting the cake. 7. Meanwhile, combine powdered sugar and cinnamon in bowl. Add milk, 1 tsp at a time until desired consistency. Pour over top of cake and let sit before serving.